Although I consider myself a food-lover, and a pretty adventurous eater, there are some foods that just kind of…give me the willies. I am fairly ashamed of this. I watch guys like Anthony Bourdain and Andrew Zimmerman tuck into soups with innards and chicken feet, bravely plundering concoctions boiled in pig’s blood or bug juice, and feel a little jealous. How rock-star cool are they? Nothing skeebs them out. After all, it’s just food, right? Well, I’m no Bourdain. Even some things that perfectly normal people eat with relish–say, chicken wings–won’t pass my lips. I don’t eat the skin of things. I just…don’t. The last time I ate chicken skin was about 4th grade, and that skin was on Gramma Rhetta’s bitchin’ fried chicken, so it was totally worth it. But when Gramma Rhetta died, fried chicken–and the skin that went with it–died too. Now I don’t really feel bad about not wanting to consume skin, but other foods that I won’t eat leave me red-faced. What kind of Foodie won’t eat caviar? Caviar is the nectar of the Gods, right? My friend Hilarie craved caviar so badly during her pregnancy that she nearly went berserk, and as soon as that baby was squalling in a cradle, Hilarie was digging into a tin of Beluga with a spoon. I watched her smack her lips and swoon with delight and felt like a total pansy. A nauseated pansy. More things I cannot stomach: acorn or butternut squash, polenta, hard-boiled eggs, innards of any kind, pimiento-stuffed olives, figs, raw fish, and any meat served on the bone (even ribs). Bloody awful! How can any self-respecting gourmand reject sushi? Or Memphis barbecue? Or chicken at a picnic? I think one of the things I’m most ashamed about is my unadulterated fear of pate. Pate is gray and squishy and suspicious. And even though I know what’s in there, I’m still afraid that the cook is hiding some other kind of hideous drek in the pate. Minced liver is bad enough–what else could be lurking in that little jar of potted muck? Confession: I went to freaking Paris and wouldn’t eat pate. I should relinquish my Foodie papers right now. The saddest thing about my Fear of Pate is that it’s keeping me from trying a Banh Mi, a traditional Vietnamese sandwich of grilled pork, lightly pickled vegetables, jalapenos and…pate. I love Vietnamese food! It’s my favorite type of cuisine–my comfort food, even–how can I profess to adore it if I reject the Bahn Mi, one of its culinary cornerstones? However, I will try to make it up to you by sharing the recipe for this sandwich. 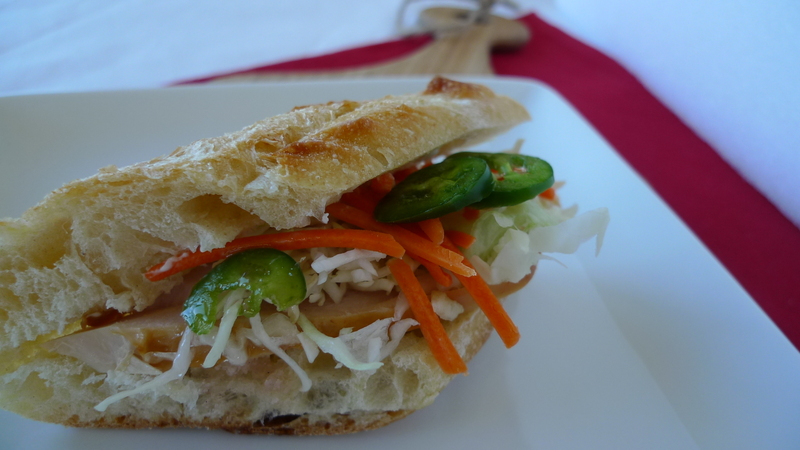 A Banh-Mi Style Chicken Sandwich. Notice I said “style.” Because this sucker has zero pate in it, so it’s not really authentic, but I greedily consumed it. It’s delightful. A blatant bastardization, but delightful. The heart of the sandwich is good crusty bread–don’t skimp. If you can, use organic chicken; yeah, I think there’s a difference. I love the interplay of sweet, salty and spicy in this sandwich. If you fear the spice, just add a wee tad of jalapeno, but don’t skip it altogether. A little kick never hurt anyone. And don’t fear the fish sauce! I know, I know, fish sauce sounds scary but in small quantities, it’s lovely. It balances out the sugar/agave and the lime juice–trust me. We made a lovely lunch of this with some nice salty chips and some Asian beer–even without the pate, the flavors definitely satisfy. Mince 1/2 teaspoon jalapeno and cut the remainder into thin slices. Set aside. Whisk together the minced jalapeno, lime juice, tamari, agave/sugar, vinegar and fish sauce; set aside. In a medium bowl, combine cabbage, carrot and enough of the jalapeno dressing to coat. Let this mixture sit for about 5-10 minutes. Slice rolls in half horizontally and toast lightly. Spread both halves with mayonnaise. Layer bottom half with chicken; season with salt and pepper. Add some of the salad and top with cilantro and jalapeno slices. Press down top layer of bread, cut in half, and serve. Anyone want to make me feel better? Share your food phobias in the comments section…please? I don’t want to be the only wuss in the woods. I guess that means pork rinds are out? Nope, hardly any phobias for me besides innards and macaroni – but I imagine I would try both if someone said they tasted good and should give it a go. When I was a kid/teen I was very fussy but then I began to find things I used to despise actually tasted better than they did when I was younger. So I adopted the attitude of always trying something – and to keep trying it – until I liked it (and if I didn’t well…keep on trying every so often anyway). If I ever have kids I will use this approach too as your taste buds do change a lot over time. And I also believe life is to short to miss out on any good food pleasure. I mean I used to detest mushrooms….now I am in heaven with those babies…and stilton…I didn’t like that as a kid but now I have to stop myself from eating a whole block as each piece I break off gives me such an overwhelming feeling of happiness…. Texture is the harder thing to deal with compared to taste…that is something the mind has trouble getting its head round – especially with things like raw fish and fish eggs and brains etc…but it is just a way of thinking…I think it could be overcome if we really wanted to. I don’t eat squirrel but give me a well prepared sweetbread and I’m on cloud 9! Can we still be friends? 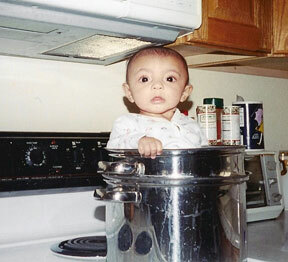 You have a fear of pate? Call me terrified! yep- this would rock my world too! (although I will now try it with pate). I love pate… always have! I was introduced to pate at Sardi’s restaurant in NYC. I don’t know if I really liked it or it was the thrill of the place that flavored my palate, but I’ve been scooping it up ever since. You are the sandwich-meister! Somehow I rarely get past a bacon and tomato sandwich but yours look totally delicious. And I’m not big on raw oysters. Since I am a belgian I eat just about anything. But I am disgusted by celery, hate it, won’t touch the stuff. OUaSsA Really appreciate you sharing this article.Really looking forward to read more. Really Great. We are a gaggle of volunteers and starting a brand new scheme in our community. Your site provided us with helpful information to paintings on. You have performed an impressive job and our whole neighborhood will probably be grateful to you.